Every project is different and prices vary greatly depending on water pressure, the size, shape and the layout of your landscaping. I can tell you that our records indicate that 90% of the sprinkler systems we have installed average around $2400 – $2800. The good news is that the price does not jump greatly from there. The best way to find out the cost of installing an irrigation system at your home or business is to Click here to receive a free estimate for your project with one of our licensed irrigators. If you have a sprinkler system issue, our experienced irrigation specialists can either fix it or replace it. Trust our sprinkler repair service to ensure that all elements of your system are working at full capacity. Looking to spruce up your yard, but don’t know where to start? Let AAIS bring your yard the landscaping attention it deserves! We install high quality sod, hardwood mulch, river rock, crushed granite, and flagstone. Contact us to schedule your complimentary appointment! 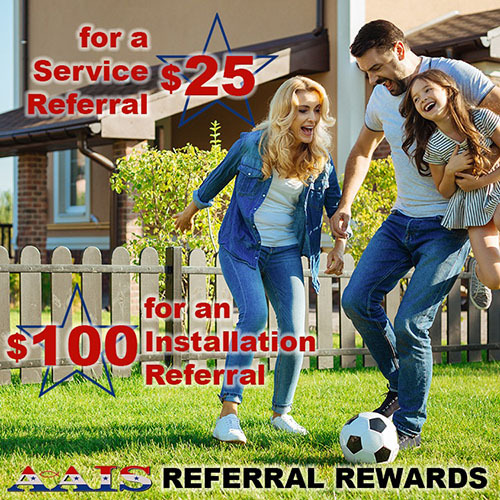 At AAIS, we offer our customers many ways to pay for their sprinkler system and other services. From cash, money order, personal check, Visa, MasterCard and Discover cards. Simply choose the payment option(s) that is right for you. At AAIS, we offer discounts for the military past and present that serve our country so loyally. In addition, we offer price breaks for senior citizens.